None of the other doggies Dad has brought home have played with me like Pinky does. Suzi played, but always tuckered out quickly, Lola never played because she’s an older girl, and we found out after she left that she was probably in a lot of pain, Herbie didn’t always play nicely with me so Dad had to keep us separated a lot of the time that he was here, and Bill just liked to cuddle, what a sap. But now that Pinky will play nicely with me, we have the best time and I don’t care what Dad says, she’s my favorite foster so far! Dad also told me that we’re going to have her for a bit longer than expected because it looks like her potential adoption isn’t going to work out. Sad face for her, but BIG PITTIE SMILE FOR ME!!! Exactly one week ago, the adoption coordinator of the Picasso Veterinary Fund of the Mayor’s Alliance for NYC’s Animals brought Pinky to me. 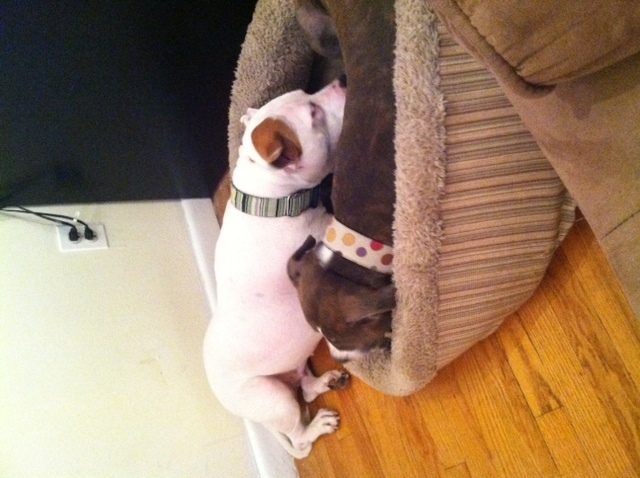 We knew that Lucy loves other dogs, and we knew that Pinky liked them too, but sometimes gets over stimulated. So we took a nice, long walk with the two of them and decided that they would be just fine living in an apartment together. And boy, are they! I haven’t seen two dogs play quite as much as these two do – wrestling, tug toys, and sloppy kissing sessions. 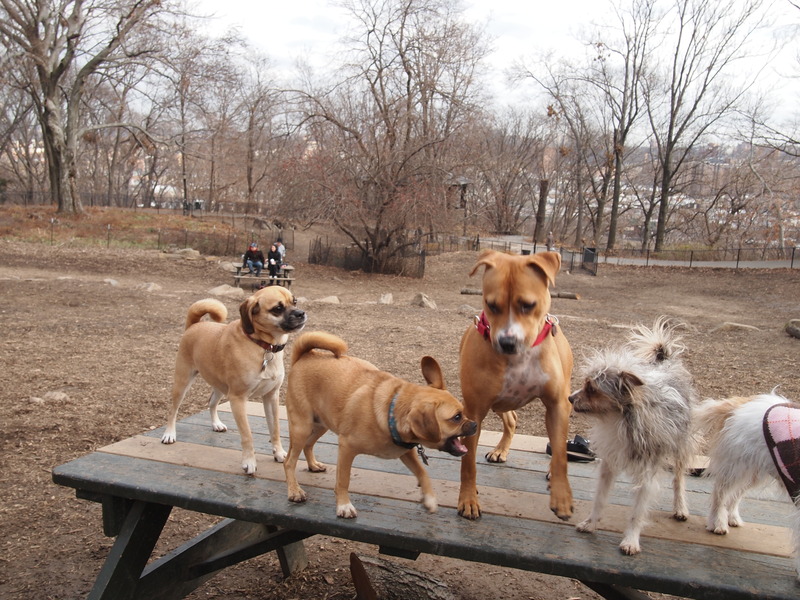 Yes, I’m coming out – my dogs are lesbians. And I’m absolutely fine with that! We’re also simply amazed that after such a long time of neglect, that she does have that drive to give and get love from humans. It’s the one thing that inspires us most about these dogs we know as “rescues”: despite what they’ve gone through, they bounce back better than before. Now, with Lucy, and me, she’s a big ball of endless energy! We have to keep her on a tie down a lot, and reward her with love when she’s in a calm state. She’s been responding very well, but still has some crazy “whirlwind” moments. And along those lines, she even already has an application for adoption – so talk about “whirlwind”! Yesterday, we met a nice, young man on the street who has been thinking about getting a dog, and just happened to love Pinky. We’ve had one more meeting with him and his girlfriend, and will have another tomorrow, but so far, everything is going well, and hopefully we’ll have great news to report very soon! And if you think you may know of a great home for sweet, little Pinky, you can get more information about her from her profile on Petfinder, and apply to adopt her by emailing pvfadoption@animalalliancenyc.org. 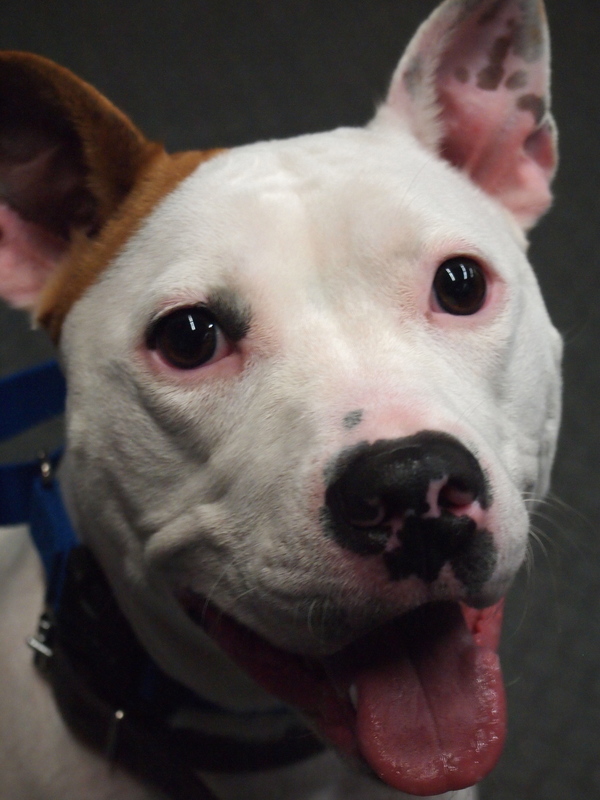 This week’s adoptable is Mr. Wonton from Animal Haven! 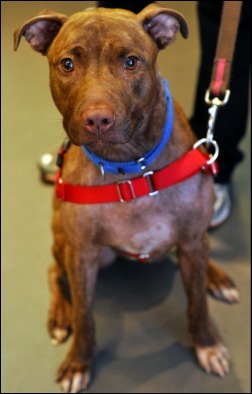 If you or anyone you know might be interested in adopting sweet Mr. Wonton, please contact Animal Haven at (212) 274-8511. 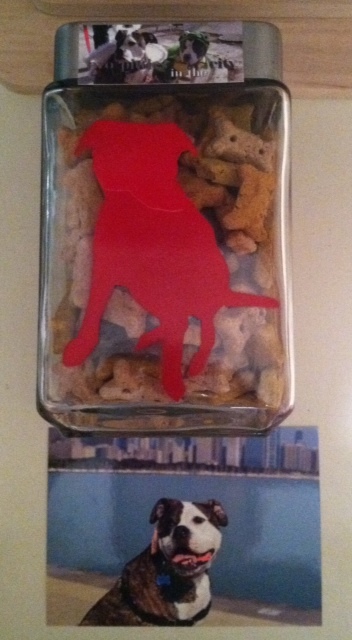 They stuffed it full of Old Mother Hubbard dog treats (some of Lucy’s faves!) and sent it along with the most adorable postcard of Miss M – is that a smile I see, Miss M? 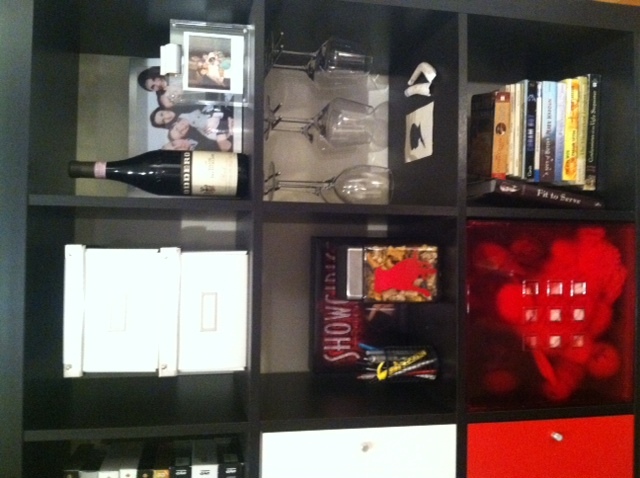 What they could not have known when making this jar is that I have used the color red in my living room as an accent color – so it fits our home PERFECTLY! So thank you Miss M, Mr B, A & E! You guys rock! The blogger that we had to get a gift for (sticking with our theme of “Two”) was Two Grad Students and a Pittie! Go check out their blog to see what we got for them! Our gift exchange did have a suggested budget, which we sort of broke, BUT we justify it because we were lucky enough that our recipient lives in the same city as us, so we didn’t have to pay for shipping! So we’re all even! Regular Foods Despite tradition, bones should never be given to pets. Even beef, ham, and other “regular” foods that are not considered toxic can cause illness in pets. If your pet is a moocher, keep a saucer of his regular treats on the table to offer when he asks. He probably won’t know the difference! Decorations Tinsel, tree ornaments, ribbons, string, and garlands are some items that can be dangerous if eaten by pets. Keep these items away from pets — especially when pets are unattended. Don’t forget to cover any electrical cords or keep them out of reach. Fire and Carbon Monoxide Monitor pets near fireplaces, wood-burning stoves, candles, and portable heaters. Also, don’t forget to check smoke detectors and carbon monoxide detectors to make sure they are functioning properly. Space heaters, furnaces, and idling cars (in a garage) can increase the risk of carbon monoxide poisoning in pets and humans. In many cases, if your pet has eaten or drunk something toxic, warning signs will include gastrointestinal problems, such as vomiting and diarrhea. Other signs may include tiredness and lack of appetite, especially in cats that have eaten lilies. If your pet shows any of these signs, or if you think he or she has eaten something dangerous but is not showing any signs yet, please call your vet right away. Treating your pet as soon as possible is essential! 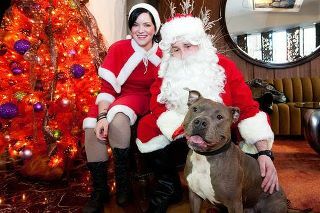 So enjoy your holidays, give your pet some very deserved love, and above all, be safe! 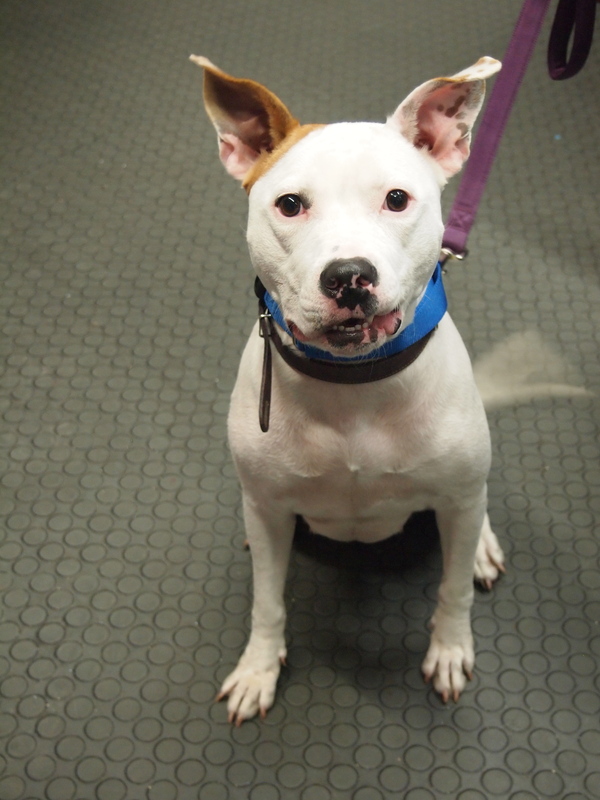 Over the weekend, we got the chance to meet a lovely little pittie girl named Pinky, who is currently adoptable through the Picasso Veterinary Fund of The Mayor’s Alliance for New York City’s Animals. Do you see that blur in the background? Yeah, that’s Pinky’s tail wagging like crazy! She’s so happy meeting new people and walking around town, it almost seems like there’s nothing she’d rather be doing. For a dog who was never really socialized as a puppy, she gets along very well with other dogs on the street and indoors – but she gets excited easily and sometimes forgets her manners. The great thing is that she loves food and treats and is eager to learn, so a dedicated person would have her behaving better in absolutely no time. Pinky is all ready to go home with her new forever family, which includes already being spayed, vaccinated, microchipped, and house-broken. For more information, please check out Pinky’s profile on Petfinder. If you or anyone you know would be interested in adopted Pinky, please contact the Picasso Veterinary Fund by calling (212) 564-4603 x 3 or email pvfadoption@animalalliancenyc.org. 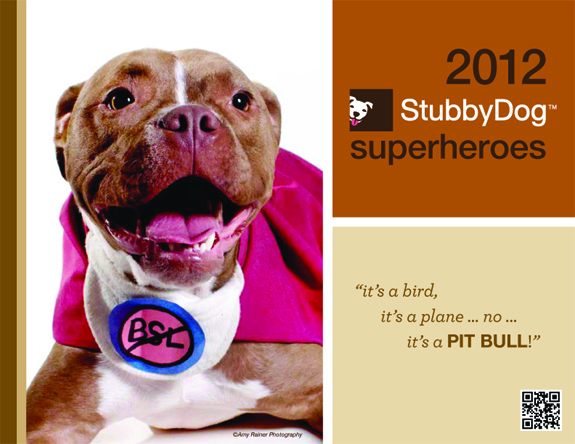 We adore StubbyDog and their mission, so of course, first on our list is their Superhero Calendar. If your order is placed by today, the calendar will arrive in time for Christmas! Who doesn’t love chocolate? 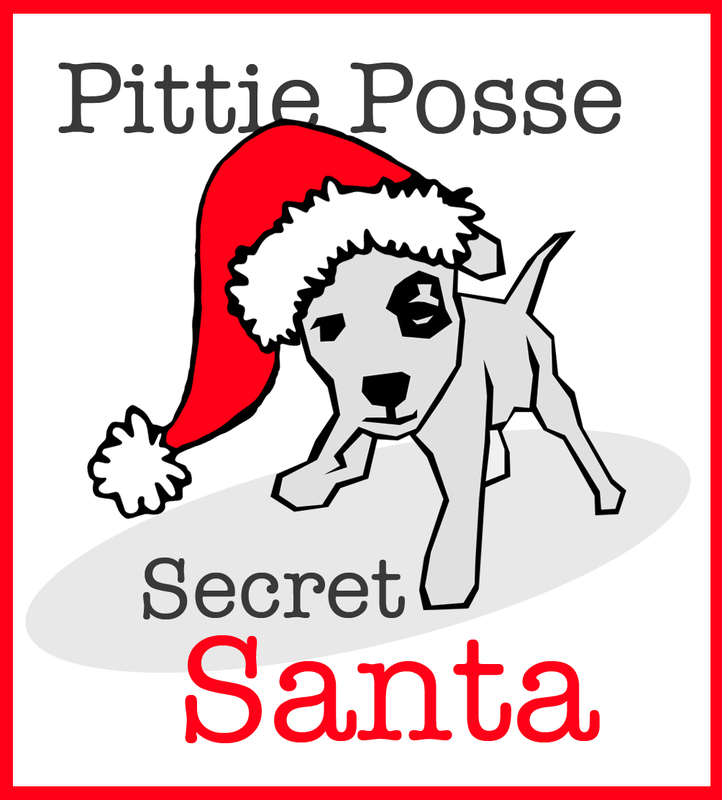 Especially bars called Peanut Butter Pit Bull and Foster-iffic Peppermint! Rescue Chocolate founder Sarah Gross donates 100% of net profits to non-profit animal rescue organizations. Proceeds from bars purchased in this month will be donated to one of our favorite groups, Animal Farm Foundation. Check out this news story about the bars and AFF. The Mayor’s Alliance for NYC’s Animals might not be a shelter, but they are responsible for assisting so many of our city’s shelters and rescues with their missions of saving as many lives as possible. This holiday, they offer two ways to give presents that give back! 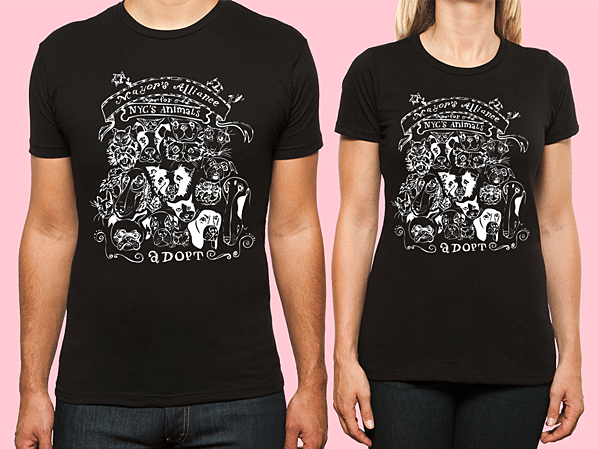 First, SocialPakt has teamed up with local artist, Liz Haywood, and has designed a tee that features the expressive faces of eighteen unique dogs and cats. Shirts are $20 and SocialPakt will donate 30% to the Alliance. Next up, Alex and Ani created an exclusive expandable wire paw prints bangle for $28 with 20% of proceeds going to the Alliance! 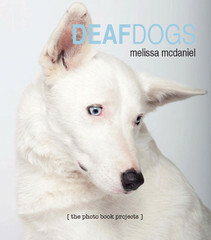 And last but not least, two wonderful books from Melissa McDaniel, DeafDogs and Pit Bull Photo Book. 10% of proceeds will be donated to animal rescue groups. I am sure most of you will recognize lots of dogs in the Pit Bull Photo Book!